I prefer I high protein diet. Fat makes you fat, sure, but glucose makes you fatter. I tend to have fun coming up with replacements for pizza, bread, and potatoes. Looking for a new protein, I decided to try my hand at Lamb T-Bones. Lamb is under-rated. People tend to turn their nose up to it, thinking it’s a gamey outdated meat, but that’s just not accurate. It doesn’t have to be gamey, it doesn’t have to be anything but delicate and delicious, and it’s perfect when grilled. A simple marinade goes a long way, and a grilled Summer Caesar is a light and flavorful compliment to the charred medium rare meat. I decided on 2 to 3 lamb t-bones per person. They’re about an inch to 1 1/2 inches thick, but we had one side to this dish, and that seemed to be the right amount to keep people full without feeling heavy after dinner. 2 TBSP freshly chopped tops of fennel (the thin greenness that looks almost like dill), optional. Mix all ingredients in a plastic zip lock baggie. It’s best to marinate the lamb for a couple of hours at least, but you can do it for as long as over night if you’d like. 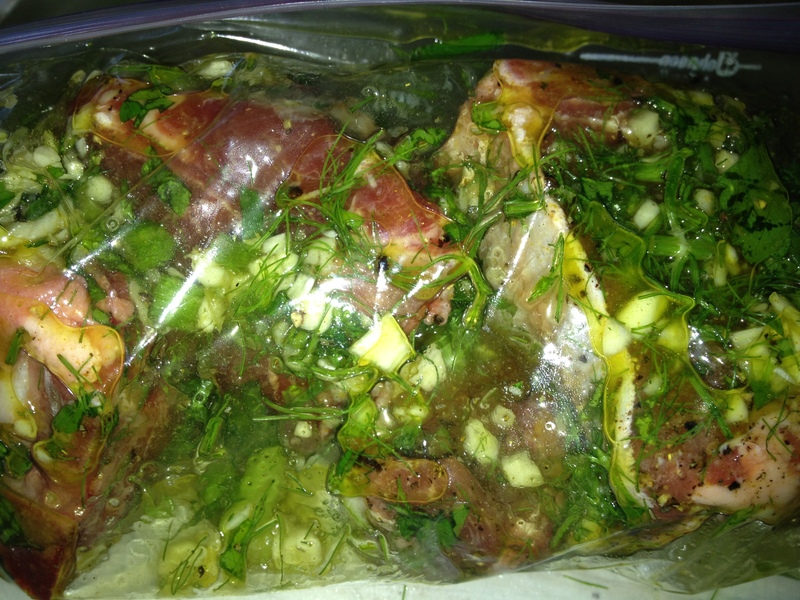 Take your lamb out of the fridge an hour prior to grilling and let come to room temperature in its marinade bag on the counter or in your sink. 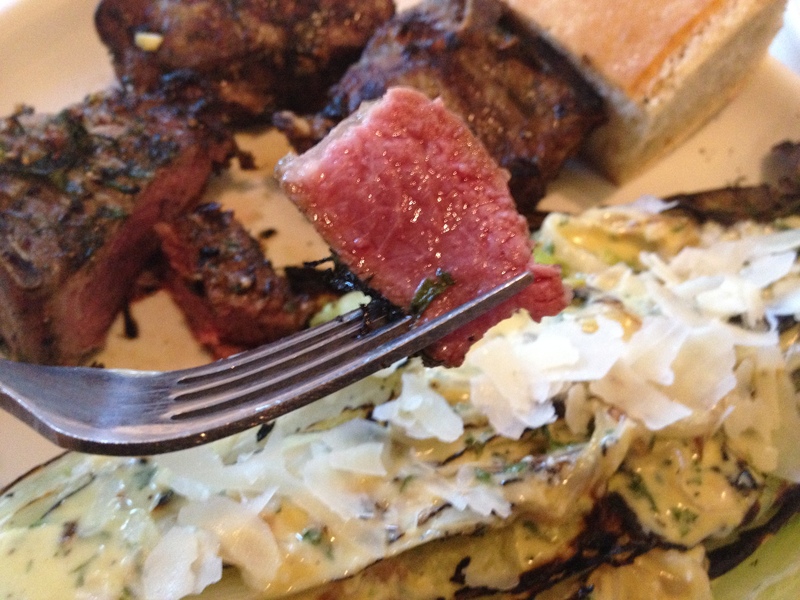 Heat your grill to high and clean your grates (which you do prior to to every time you grill, right?). 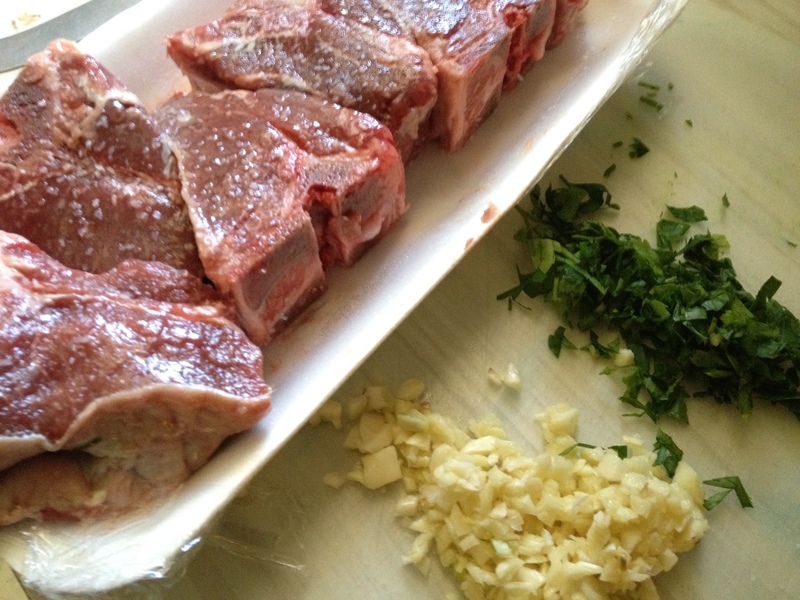 Place the marinated lamb on the hot grill, close the lid, and turn the heat down to medium high. Grill for 3 minutes and then turn the lamb 1/4 turn and grill for another three minutes with the lid closed. That’s you’re “pretty” side. Flip the lamp t-bones over and grill for an additional 4-6 minutes or until the internal temperature reaches 140-145 F. That’s for medium rare lamb. Keep in mind that lamb, like salmon, has a more delicate flavor the less it’s cooked, so stay away from gamey by staying away from medium to well done. We served ours with a hunk of rustic bread and the aforementioned Caesar Salad, recipe here. Pink and delicious – no gamey-ness! So good for summer that you’ll miss it come winter! 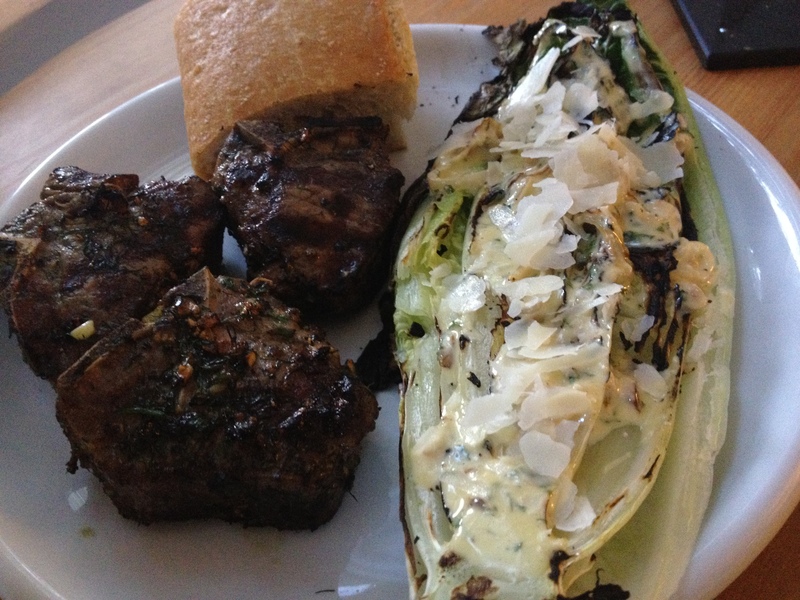 This entry was posted in Comedy, Entertainment, Food, Recipes and tagged chop, chops, cooking, easy, family dinner, fast, grill, grilled, grilling, healthy, lamb, paleo diet, protein, steak, summer recipe, t-bone, tbone.